Thanks again for this quote, to our good friend, A Simple Jew, G-d bless him!!! THIS REMINDS ME of a story that Reb Shlomo Carlebach used to tell. It was during the days of the Iron Curtain, when Soviet Jewry was suffering so much persecution at the hands of the Communist regime there. At the time, there was a trial going on of some Jewish refuseniks from Leningrad. He arrived at the Kosel [the Western Wall], as usual, with his guitar. The news that he received was that the trial was going bad for the Jews, and they might be convicted, which would lead either to lengthy imprisonment or death. He was about to put his guitar away, when a Rabbi at the Kosel told him, "This is not a time to mourn. Now is the time to make up a new song." He opened the Siddur [prayer book], and composed, on the spot, "Motzi Asirim." The words are from the portion right before we say the silent prayer, the Amida, and are: "You release the prisoners, You redeem the humble, help the poor, and answer Your People Israel, when they cry out to You." With this in mind, I would like to dedicate the following piece to the Modzitzer Rebbe Shlita, who is still unconscious in Ichilov Hospital in Tel-Aviv. May he have a Refua Shelaim b'Karov, a full and speedy recovery, and may Hashem answer our prayers for him soon! Rebbe Yechezkel of Kuzmir, the Avi Shosheles [forefather] of the Kuzmir-Zvolin-Modzitz Chassidic dynasty, "proclaimed that a Shabbos without a new niggun was truly not a Shabbos" [Melodies of Modzitz, p. 13]. How much more so should this apply to a New Year! In this vein, the Modzitzer Rebbes would compose about a dozen or so new niggunim EVERY YEAR, to be used in the various parts of the long Yamim Noraim [High Holyday] liturgy. Today is the 25th of Elul, the anniversary of the day the World was created. On Rosh Hashana, Hayom Haras Olam - "today is the Birthday of the World" - is one of the prayers recited at Shofar blowing. The other is Areshes S'faseinu ["may the stirrings of our lips be accepted," etc.]. These are just two of the dozen parts of the Yamim Noraim service that received new niggunim every year in Modzitz. These two were almost always waltzes, in 3/4 time. I do not have easy access as to what sections of the Yamim Noraim service the first two Rebbes of Modzitz, the Divrei Yisrael and the Imrei Shaul, used to compose niggunim for each year. We do have traces - several niggunim to the various sections of the liturgy. But in the last 50 years or so [the Imrei Aish became the Modzitzer Rebbe in 1947! ], we have a pretty accurate picture. In Tel-Aviv: Rebbe Shmuel Eliyahu [the Imrei Aish], in New York: Reb Ben Zion Shenker, and since 1995 in Bnei Brak [before that, between 1984 and 1995 in Tel-Aviv]: the Modzitzer Rebbe Shlita would present to their Chassidim and other mispallelim [congregants] some 10 to 15 new niggunim every year, sung at Selichos, Rosh Hashana and Yom Kippur davening. 1) Kaddish-Tiskabeil, a lively dance tune. Today's Modzitzer Rebbe Shilta introduces it on the first night of Selichos. In fact this year, it was introduced in his absence, as he taught it to the Chassidim before he was hospitalized. 2) Mechalkeil Chaim - at the beginning of Shmoneh Esre. This is usually a very serious tune, suited to the words. The Imrei Aish had a "bim-bom signature" to introduce this tune each year. 3) Simcha L'artzecha - a lively, simcha-dik [joyous] tune. We have some from the Imrei Shaul, and a Chassid of his, Kaufman-Yiddel Eidelson, as well. 4) Kadsheinu - this is generally a lively dance tune, but we have one from the Imrei Shaul that is more moderate. 5) Hayom Haras Olam - a waltz, as mentioned. 6) Ein Kitzva - a lively malchus-dik [regal] march. I almost always hear trumpets when this tune is sung. 7) Veyesayu - also usually a regal march. We have one from the Imrei Shaul, too. 8) Areshes S'faseinu - a waltz, as above. 9) Hallelukah - usually a lively waltz niggun. 10) Heyei im Pifios - a lengthy Tish niggun. There will be more to come on this later. Right now I have to get over to the Kosel to pray for the Rebbe Shlita! There has been some slow and steady improvement, and the doctors are pleased with it so far. The Rebbe Shlita is still unconscious, but responds to sounds and requests to some degree. He is moving his right arm and leg, and apparently has moved his left fingers somewhat as well - but we don't know if these were all done "randomly," or in response to doctor's requests. They have reason to hope that he will actually "come to" over the next couple of days. All things considered, the Rebbe Shlita still needs Rachamei Shamayim Merubim [much Heavenly Mercy], and we should all continue to daven for: Rebbe Yisrael Dan ben Rivka Zlata for a refua shleima - a full recovery. The situation is stable, with slow, small improvements. There's no significant change in the Rebbe Shlita's health over the past day - a little bit of movement in the right limbs, but he has yet to "wake up". He has been off sedation since Sunday, so it will probably still take some time for that. On Shabbos, he did respond to hearing some of the Chassidim singing near his room, and we all daven that HaKadosh Baruch Hu should allow those tears, along with the tears of countless others, to be me'orer Rachamei Shamayim Merubim - [to arouse much Heavenly Mercy]. Rabbi Menachem Goldberger is the son of Rabbi Daniel and Ida Goldberger. He grew up on the East Side of Denver, where his father was the spiritual leader of Beth HaMedrash HaGadol-Beth Joseph (BMH-BJ) Synagogue, 1951-71. At that time, Menachem was one of the youngest members of the Beth Joseph men's choir. Later, Menachem Goldberger became a close disciple of the late Rabbi B.C. Shloime Twerski, the Hornesteipel Rebbe Zt"l, who founded the Talmudic Research Institute (TRI). In 1987, Rabbi Menachem Goldberger and his wife Bracha, a Denver native who attended Beth Jacob High School, moved to the East Coast and founded the now thriving Tiferes Yisroel congregation in Baltimore. Rabbi Goldberger’s appearance is like an old-world Chassidic rebbe, complete with a long white beard (he is only in his 40s), long black satin cloak and round fur hat [shtreimel]. A composer of liturgical songs and melodies (niggunim), when he davens the Kabbalas Shabbos service, Rabbi Goldberger often uses an original, stirring melody for Lecha Dodi, the traditional prayer sung to welcome the Sabbath -- a melody now sung around the world. Rabbi Goldberger's strong yet delicate, melodious voice goes beautifully with that mesmerizing tune, which can set the mood for Shabbos. One Motzaei Shabbos in Denver, BMH-BJ hosted a Melave Malka, a traditional, festive post-Shabbos meal, symbolic of escorting out the "Sabbath queen," while clinging to the warm, sweet feelings of Shabbos for just a little while longer. Especially touching was the presence of Rabbi Daniel and Ida Goldberger, who beamed with pride as they sat in the front row during a concert by their son Menachem. In fact, at one point, after the younger Rabbi Goldberger led the audience in singing his Lecha Dodi melody, his mother Ida stood up, took the microphone and proclaimed to the audience: "He's too modest. I just want you to know -- he wrote that himself!" Indeed, Lecha Dodi is the title of Rabbi Menachem Goldberger's CD, which I was privileged to obtain on a recent visit to Tzfas, Ir HaKodesh [the Holy City]. The album was issued in America last November . 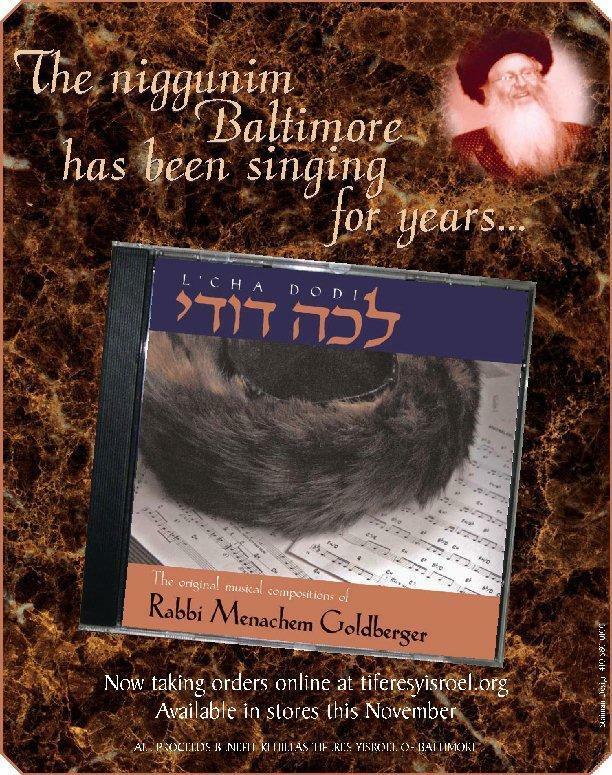 I originally had heard the Lecha Dodi tune on a trip to Baltimore in 1990 [and it's safe to say that it wasn't brand new then, either], so it's no hype -- these niggunim are ones that "Baltimore has been singing for years." The album is beautifully and professionally done, with full musical accompaniment and instrumentation, including a string quartet [violin, cello, viola and bass], piano & keyboards, guitars, mandolin and percussion. Indeed, the work of Rabbi Menachem Goldberger, and of course, Rebbe Mordechai Dov Ber Twerski Shlita [check out some of his latest music here], have now taken the music of Hornesteipel and the Twerski family one generation further! We hope that this is only the first of many more albums to come! Tonight is the yahrzeit of the Heiliger Pele Yoeitz, Rebbe Mordechai Dov Ber of Hornesteipel. A direct descendant of the Rebbe Reb Zusia of Anipoli, he was also the grandson and successor of the Cherkassy Rebbe, a son-in-law of Rebbe Chaim of Sanz, and a tremendous Talmid Chacham [Torah scholar] and Chassidic Rebbe in his own right. The story of how he saved a Jew at the Mikveh is as fascinating as it is amazing. "The sounding of the Shofar has an effect on our Tefillos [prayers] for the entire year. On Rosh Hashana, we recite [Tehillim/Psalms 130:2], "O My L-rd, hear my voice; let Your ears listen to the sound of my plea." (Note: the Hebrew word, "Kol" can mean either voice or sound). The Pele Yoeitz wonders why the verse begins with the word, "Kol" by itself, and then ends with "Kol Tachanunai" - the sound of my plea. He explains that there are two forms of prayer. A prayer that is manifest in words, even if it comes from the depths of one's heart, is not as lofty as another form of prayer. That is, one which emanates from the desire of the heart - which is a revelation of the innermost essence of one's heart, which cannot be confined into words, or letters - but rather is a simple voice or sound. This is the message of the Shofar on Rosh Hashana, which is but a simple sound. This tells us that we must strive to reveal that innermost essence of our heart, the heart's desire - in the form of a simple crying voice, and this can prepare us that our Tefillos throughout the year come from the depths of our heart, as we plead before Hashem. So we thus ask Hashem to "hear our voice" - the simple sound of the Shofar on Rosh Hashana - so that "Your ears [will] listen to the sound of my plea" throughout the year - that our pleas to Hashem in our Tefillos every day of the year will be heard. from our good friend in the Blogosphere, A Simple Jew - thanks! NOTE: THIS POSTING WILL PROBABLY BE UPDATED FROM TIME TO TIME - SO PLEASE WATCH THIS SPACE! 1. The Rebbe Shita - There have been a few small signs of improvement today, B"H. But the Rebbe Shlita still needs Rachamei Shamayim [Heavenly mercy], and our tefillos [prayers]. Tonight, Thursday night, everyone who can join in is asked to come to the Kosel [Western Wall] in Yerushalyim at 9:15 for Kriyas Tehillim (the Book of Psalms in its entirety), and tefillos for the Rebbe's health. Buses will be coming in from Bnei Brak and elsewhere. Every person counts! If you are too far away, or for other reasons unable to attend, please join us from wherever you are at that time, and daven for the Rebbe's refuah shleimah [full recovery]. Please continue to daven for [HaRav] YISRAEL DAN ben RIVKA ZLATA, for a Refua Shelaima b'Karov - a full and speedy recovery! May we all have better Besoros [news] - very soon! 2. The Modzitz website is back, with updates on the Rebbe Shlita's condition [see above] and an announcement about the passing of its Webmaster, R. Hershel Taub z"l, as well as the passing of his brother, R. Yitzchak Taub z"l. Be sure to check it [and here] frequently for probably the only accurate updates of the Rebbe Shlita's condition. 3. The Rebbe Shita remains in intensive care in Ichilov Hospital, Tel-Aviv. The Chassidim and others have been davening [praying] for his full recovery at locations throughout Israel, including the Rebbe's Beis Medrash in Bnei Brak; the Kotel [Western Wall], Shtibel [Shul], and Har HaZeisim [Mount of Olives, where the Rebbe's father and grandfather are buried], all in Yerushalayim; and at the gravesite of Rabbi Shimon bar Yochai in Meron; as well as in the Modzitz Shtibel in Flatbush, New York, USA [more above (1)]. Tonight is Chai [the 18th of] Elul, yahrzeit of the Maharal of Prague, as well as the Birthday of the Founder of Chassidus, the Baal Shem Tov, and the Founder of Chabad Chassidus, Rebbe Schneur Zalman of Liadi. 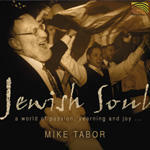 One person who combines both the music of the Baal Shem Tov and Chabad is Mike Tabor, whose "Jewish Soul" album [pictured above] features a rare niggun of the Baal Shem Tov [second tune on the link], as well as a number of Chabad tunes: "Inner Thoughts," V'Somachta, Utzu Eitza, a Farbrenghen Niggun, and a Yiddish tune, "Vos darf mir sorgen?" Very interesting, too, is the Bandit's Niggun [first tune], which was discovered by a friend of Mike's on a trip to Eastern Turkey, upon being ambushed by a band of... Bandits! Mike Tabor is also known as "Reb Shlomo Carlebach's man in Manchester," and indeed, he was very close to Reb Shlomo. This album has been out for some time, but well worth ordering from Arc Music in Britain. Enjoy! 1. The Modzitzer Rebbe Shlita has been hospitalized (Ichilov Hospital in Tel-Aviv), after collapsing Sunday morning. (He has since regained consciousness). 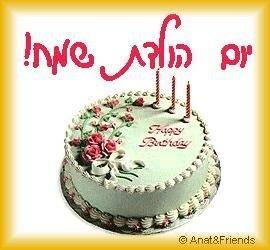 Please daven [pray] for YISRAEL DAN ben RIVKA ZLATA, for a full recovery!!! After davening yesterday at the Kotel [Western Wall], the Chassidim will be davening for him in his Beis Medrash at 20 Habakuk Street, Bnei Brak, at 8:30 pm tonight. To the post [directly below] about the Cherkassy Rebbe and Twerski niggunim. Hopefully, I will be updating and completing this post this week. Watch this space! Meanwhile, we'll enjoy seeing your comments! 3. 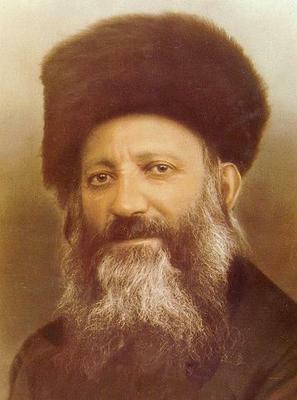 RAV KOOK - a. 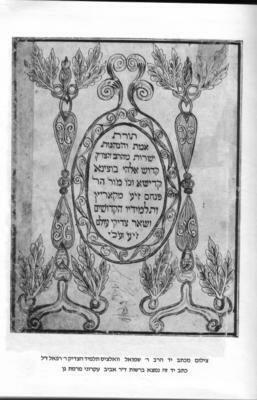 A handwritten manuscript of a new poem of his was just recovered [link is in Hebrew, if there's a translation of this later, I will post it]. b. Read about his blowing of the Shofar in Elul. This Shabbos, the 13th of Elul, is the yahrzeit of Rebbe Yaakov Yisrael of Cherkassy, a Twerski ancestor. Before we get to the niggunim, we need a little history. 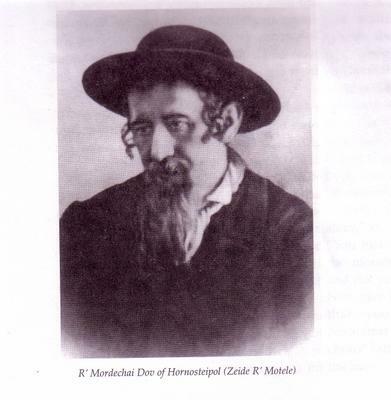 Rebbe Menachem Nachum of Chernobyl was a talmid of the Baal Shem Tov and then of the Maggid of Mezritch. His son, Rebbe Mordechai, the Maggid of Chernobyl, had eight sons to whom he referred as "the eight candles of the Menorah," and all of them became Chassidic Rebbes. One of them was Rebbe Yaakov Yisrael who became a Rebbe in the town of Hornesteipel, and in the latter years of his life moved to Cherkassy. The following is a quote from R. Avraham Twerski's book, "The Zeide Reb Motele": The Cherkassy Zeide was sixteen when he married Devorah Leah [daughter of the Mitteler Rebbe of Chabad, and granddaughter of the Rebbe Schneur Zalman of Liadi], and was fortunate to spend two years under the tutelage of the Alter Rebbe in Liadi. We have only a few stories about their relationship. "The Alter Rebbe stroked his beard and said, 'The beard is too white for me take on any new practices. However, when my Siddur will be printed, I will have v'shomru included.' "
Indeed, v'shomru appears in the Chabad Siddur, although it is not recited by Chabad Chassidim. "Hinei ma tov, u'ma naim, sheves achim gam yachad - How good and pleasant it is, when brothers sit down together" [Tehillim, 133:1]. Reb Hershel Taub z"l's father, the Imrei Shaul, brings a statement of our Sages - Chazal - that says that Yaakov [Jacob] Avinu took the letter "Vav" from the name of Eliyahu HaNavi [Elijah the Prophet], as a security, that he would come and inform his children of the Redemption. Why the letter "Vav"? R. Shaul asks. This indicates that even if we are not worthy, and the only thing we have going for us is the attachment - as symbolized by the letter Vav [which means "and"] - to one another with "baseless" love, we will merit the full Redemption, may it come soon! As mentioned, it was truly awesome. Only a few short days after the disengagement/expulsion of Jews from Sa-Nur and Chomesh, a few short kilometers from Shavei Shomron, and the Modzitzer Rebbe Shlita, with dozens [close to 100] of his Chassidim, comes there to honor his recently-departed uncle and to make a Tish [a Chassidic gathering, centered around a meal at the Rebbe's table = Tish] - and of course, to provide chizuk and support for the beleagured residents of the yishuv. A full bus of Chassidim, plus a number of private cars, made the journey from Bnei Brak to Shavei Shomron. Arriving not too long before sunset, we hurried down to Shavei Shomron's cemetery, to pay our respect to R. Hersh z"l with the recital of several Tehillim in his memory. Upon finishing, we hurried back to the Beit Knesset [synagogue] to join Moshe Taub and R. Hersh's other sons in the Mincha [afternoon] service. The sun was just about setting, and the Modzitzer Rebbe was due to arrive shortly. The Rebbe was greeted by his family, his Chassidim and the residents of Shavei Shomron, and immediately entered the Beit Knesset for Ma'ariv [evening service]. The short service ended, and everyone made their way over to the hall that was set up for the Tish, which included a full meal for all the guests, and a video which simultaneously showed everything that transpired to the women, who were gathered in an adjoining hall. The tables were beautifully set with food for a fine meal, and the Rebbe, as he does at a Tish, shared his food with his guests: the Chassidim and residents of Shavei. L'Chaim toasts were made as well. An acappella recording of some Modzitz niggunim played in the background. Reb Hersh's son Moshe made a Siyum Masechta - completion of a tractate of Talmud - in his father's memory. 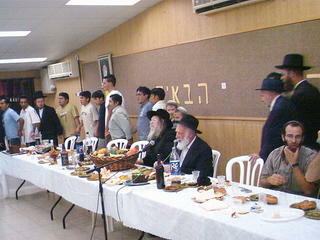 Shavei Shomron residents, and Modzitz Chassidim, also made a Siyum Mishnayos - a completion of the entire Mishna. This was followed by the traditional Kaddish. Soon there were some speeches - describing the area we were in and its history, and of course, hespedim [eulogies] for R. Hersh by the local Rabbis. Then it was the Rebbe Shlita's turn. He opened with a stirring Tish niggun, and soon we were all transported - to Bnei Brak, to Modzitz [Poland], to the Beis HaMikdash - it was truly uplifting. As I sang along, my mind sometimes reflected on past Tishes, where R. Hersh z"l would be sitting a few feet away from the Rebbe Shlita - and I broke into tears. I should mention that in recent years, R. Hersh came - consistently - to every Modzitz Tish and Simcha with two other Shavei Shomron residents, who have become regulars on their own accord. They often would bring their children and/or friends as well. Shortly thereafter, the Rebbe said a lengthy drasha [Torah discourse] in Yiddish, on the weekly Torah portion, and about the upcoming month of Elul. Then R. David Zeira, a practicing lawyer by day, and head of the Modzitz Machon L'Negina [Music Institute], spoke very warmly to the residents of Shavei Shomron, quoting various portions of the sefer Imrei Shaul by the second Modzitzer Rebbe, about the sanctity of Eretz Yisrael. He was followed by R. Yehoshua Kempinski, who has one of the sweetest voices in Modzitz. 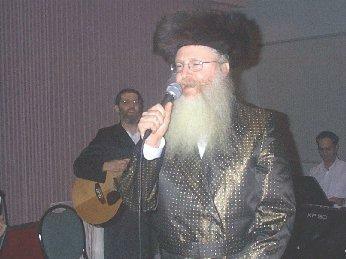 He sang three niggunim, from R. Shaul, from the Imrei Aish and from the Rebbe Shlita, which everyone accompanied. Finally, the "ball passed" over to Rav Avraham Shenker, R. Hersh z"l's brother-in-law, who sang an inspiring niggun, followed by a dance tune of the Rebbe Shlita's, that everyone rose up and danced to. There was really a feeling of warmth and achdus [unity], as the dance and the Tish came to a close. We made the long journey back to Bnei Brak [and for us, on to Yerushalayim], tired but truly uplifted by this inspiring event. Our deep gratitude goes out to Ora Taub, R. Hersh z"l's widow, for her tireless efforts in making this event happen! We hope it is only the beginning of a real "Sheves Achim gam yachad", a true unity of Modzitz, from Bnei Brak to Shavei Shomron. Today, the 3rd of Elul, is the 70th yahrzeit [anniversary of the passing] of HaRav Avraham Yitzchak HaKohen Kook Zt"l. Although he is not known to have composed niggunim, Rav Kook often expressed himself - perhaps most deeply - through his poetry. And, perhaps somewhat poetically, it can be said that his entire life was a song, and that his Soul Sang with a Unique Melody. What is the difference between mizmor and shir? Why is this phrase appropriate for our daily initiation into prayer? And what is the connection to the Temple dedication? Heartfelt emotion, emanating from the depths of the soul, lies hidden in the crevices of life. When these feelings burst forth, they cannot be composed into words and expressed by speech. Without thought, we happily hum a tune. We give voice to our emotions through zemer, in the notes of a tune or melody. This is mizmor, the musical outpouring of the soul. As our feelings expand and become more revealed, they connect with our powers of thought and cognition. They reach the treasury of language and speech. This is the level of shir, song and poetry. We can now articulate the outburst of emotion using our mental faculties of reason and language. When we join together "mizmor shir", we link our emotional and intellectual sides. First, mizmor, musical expression from the depth of emotion and outpouring of the soul. Then, shir, poetic expression from holy meditation and thought. When we enter our house of prayer, we need to aspire to the sublime ideal of "mizmor shir". We should fully awaken our emotional and intellectual potential for praise and joy. These two holy faculties achieved their greatest expression when the place most suitable for spiritual elevation was completed - at the dedication of the Holy Temple in Jerusalem. "A melody, a song, for the Temple inauguration." My thanks to Chanan Morrison, and his excellent website, for this. Chanan's divrei Torah, usually translations and excellent compilations from various writings of Rav Kook, can also be found on Arutz-7's English website, in the Torah section. Finally, there actually is a recording of "Shirei HaRav Kook Zt"l" - Rav Kook's songs. 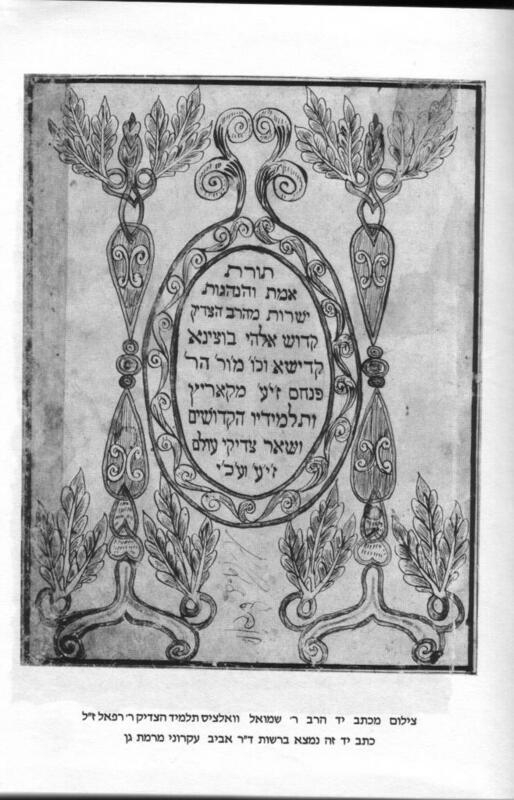 It consists of ten of his poems that were set to music, by A. Schreiber, who was also the producer; David Leibowitz, who also conducted the choir; and Meir Shimon Geshuri, who's authored several books about Chassidic negina, including "Negina v'Chassidus B'veis Kuzmir U'vnoseha - Melody and Chassidus in the House of Kuzmir and its Offshoots." (The "offshoots" refer to Zvolin [son of the Kuzmirer Rebbe] and Modzitz - the first Modzitzer Rebbe being the grandson of the Kuzmirer Rebbe.) This recording was issued by Gal-Paz in 1985, on the occasion of Rav Kook's 50th yahrzeit. Zechuso yagein Aleinu - May his merit protect us! With the advent of Rosh Chodesh Elul today and tomorrow, our thoughts turn towards Selichos [prayers for forgiveness], which our Sefardi brothers begin reciting tomorrow, and we Ashkenazim begin on Motzaei Shabbos Parshas Ki Savo, 21 Elul - or less than three weeks from now! As is well-known, Reb Shlomo Carlebach's Selichos were very special. Last year, a recording of them was issued, and can be ordered from "Mostly Music." Prices range from $9.99 for a cassette to $24.99 for a video. Of course, "everybody knows" that there are now Carlebach-style minyanim all over the world, especially here in Eretz Yisrael and in America. The "mother" of these minyanim is Reb Shlomo's own Manhattan-based [305 West 79th St.] Shul, which continues in this tradition. A comprehensive report on last year's Selichos at the Carlebach Shul can be read at Michael Steinhart's blog HaMincha. This year's Selichos at the Carlebach Shul features a concert by Pey-Dalid at 9:45 pm, a pre-Selichos drasha by Rabbi Naftali Citron at 12:15 am, followed by the Selichos themselves, led by Chazan Yehuda Green at 12:45 am. I have heard Yehuda at various kumzitzes and can testify that, as R. Shlomo would say, "he's the greatest!" It was awesome - the Modzitzer Rebbe Shlita, dozens of his Chassidim, visited the dozens of residents of Shavei Shomron, where the Rebbe's uncle, R. Hershel Taub z"l, lived. It was the Shloshim, end of the 30-day mourning period, for R. Hershel z"l. After a ceremony at the Shavei Shomron cemetery, a Seudas Mitzva in R. Hersh z"l's honor was held. Chassidim and Residents of Shavei Shomron dancing to a lively Modzitz niggun, composed by the Rebbe Shlita. 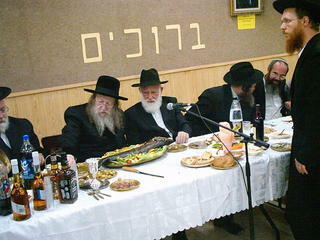 The Rebbe Shlita at the dais, with his uncle, R. Avraham Shenker, next to him. The Rav of Shavei Shomron is seated next to R. Shenker. [R. Shenker is a brother-in-law of R. Hersh z"l]. 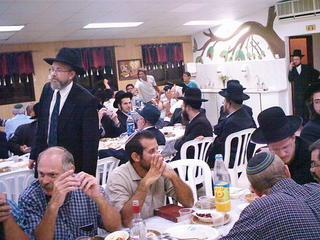 Some of the attendees, Chassidim and Shavei Shomron residents alike, partaking in the Seudas Mitzva. 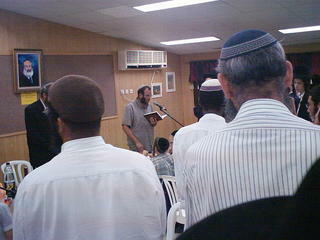 R. Moshe Taub, son of R. Hershel Taub z"l, making a Siyum. He finished an entire tractate of Gemara, while several residents and some of the Chassidim finished the entire six orders of Mishna. So it was a double-Siyum! A fuller report will be posted here shortly. Watch this space!!! My wife once asked Rabbi Nachman Bulman Zt"l what makes music "Jewish music." He answered immediately, as only he could: "If it has been through the crucible of Jewish experience." That there have been many "Jewish music" artists who have used non-Jewish sources for their music has been discussed a lot lately, notably here and at this blog which starts around here, and continues throughout the month of June. One of the comments I made in the Blog in Dm thread was "Why even the famous "Chabad" tune, "Shamil," has its origins in a Ukranian peasant folksong! [See the liner notes to Andy Statman's "The Hidden Light" for more about this]." "...the only music played over the Public Address system is Lubavitcher niggunim. Niggunim are usually wordless melodies written by Chassidic leaders as part of their Divine service...Many campers already have the popular Jewish rock artists on their shelves at home, but may not have experienced more soulful niggunim." I'm know I'm quoting this somewhat out of context [indeed, check out the entire post there! ], but I think there's an important message here - the music composed by Chassidic or other Rebbes as "part of their Divine service" or avodas Hashem, certainly can be more soulful, and should be appreciated as such. However, as my comment at "The Mikveh" indicates, one needs to know the true origins of the tune - as sometimes what seems to be a non-Jewish source may turn out to be a Jewish one, and vice versa!